Last week was another humbling experience. Again I learned how little I know when it comes to Greek. 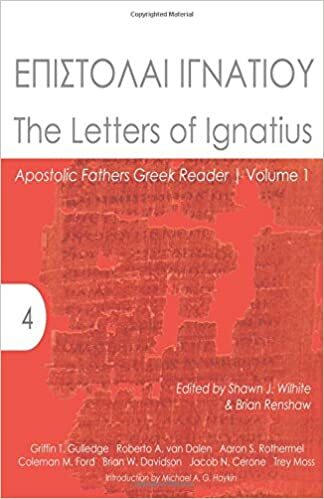 I sat in on one of this semester’s Septuagint classes. The assignment was to translate an English passage into Greek (and Hebrew). We were asked to also include the diacritical markings. Other than the smooth and rough breathing marks, punctuation, and how to distinguish εἶ “you are” from εἰ “if,” I have never learned nor been taught breathing marks. Sure, I know that ´ is an acute, ` is a grave, and ῀ is a circumflex. But where, how, and when they appear, ich weiß nicht. Chandler indeed laments that modern scholars scatter their Greek accents about rather recklessly, but he adds: “In England, at all events, every man will accent his Greek properly who wishes to stand well with the world.” It is a comfort to find one’s accents irreproachable, and Chandler rightly urges that the only way to use the accents properly is to pronounce according to the accent. Needless to say, I would not be able to stand well in Chandler’s or Robertson’s world. I’m not sure if this is true today. Accenting is a matter on which few rarely speak. My beginning grammar teacher taught us a few basic rules in the second week of class, but he promptly told us to forget them. Between then and now, only Dr. Black has stressed the importance of putting the emphasis on the right syllable. Now that I have the book, I need to find the time to read it. Here is to hoping I find the time, and find something profitable in this work. This entry was posted in Greek and tagged D. A. Carson, Greek, Greek Accents. Bookmark the permalink. Chase and Phillips (A New Introduction to Greek) have a very user-friendly approach to the accents. It is the first thing they teach in their introductory grammar. The same holds true of Gresham Machen’s Intro Grammar. Personally, I never had the nerves to read Carson’s tome, but found these two works very helpful with accents. I will have to check out both of those sections. After only the first couple of pages he has already started throwing around terms like oxytone, paroxytone, proparoxytone, perispomenon, properispomenon, and barytone. 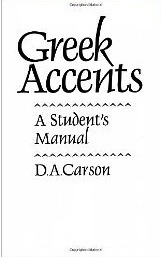 I ordered Carson before it occurred to me that you might have included a section on Accents in the Appendix. I knew it wasn’t in the main text, as I just taught through it. After reading the first pages of Carson and becoming a bit discouraged, I found it odd that you wouldn’t have included anything on accents in the grammar. To wrap up a long story, I found it and will read it before moving any further in Carson.